Theobald Wolfe Tone was the founding member of the United Irishmen and leader of the 1798 Irish Rebellion. Born in Dublin on June of 1763 he is considered the father of Irish Republicanism who died at the age of 35. 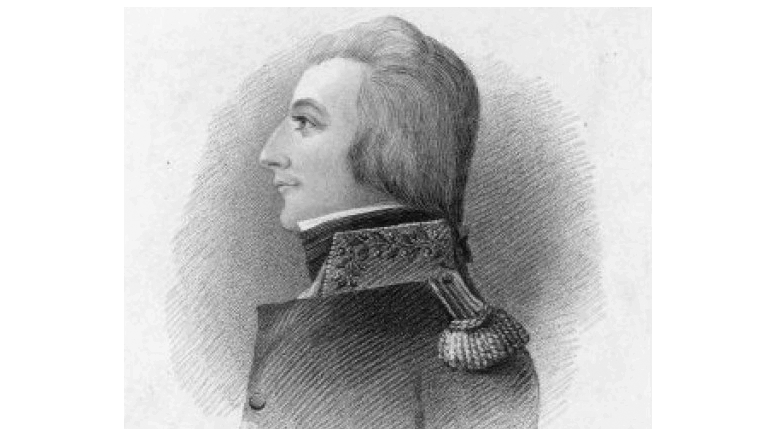 Theobald Wolfe Tone was the eldest child. His father, Peter Tone, was a member of the Church of Ireland who owned a farm near Naasin Kildare. His mother, A Catholic, would later convert to after the birth of Wolfe Tone. As the eldest he considered himself his parents favorite and was sent to a first-rate English school when he was aged 8 or 9.After 3 years of Education his parents were advised to send Theobald to Latin school and to prepare for university. With his father fronting the costs forhis education he went onto Dublin College to learn Latin and then Greek. Theobald found a passion for the army, especially when attending parades and field days at the Dublin garrison in Phoenix Park. He had a desire to become a solider and at the age of 16 he would be able to join. By 17 he started having a dislike for a learned profession and a passion for the army grew. He distant himself from college and was only interest in learning about the army. His father strongly disagreed, refused to offer financial assistance leaving Theobald no choice but to resume his education. At the age of 17 Theobald Wolfe Tone joined Trinity College in 1781 under the tuition of rev Matthew Young, one of the first mathematicians in Europe. 4 years later he met a girl named Martha Witherington, the daughter of a captain in the West India trade who would become his wife that year. After marrying Theobald she changed her name to Matilda Tone and gave birth to a baby daughter. Now living in the family farm in Kildare Theobald went to London to study law. Living in Theobald’s family farm in Kildare it wasn’t long until he took up studing law in London, leaving his family in the hands of his father. It was when in London he met associates who were like-minded thinkers. They would discuss and toy with the idea of a military colony in a newly discovered island in the South Sea. Theobald drafted a memorial on their idea and delievered it to Downing street for the British Prime Minister, William Pitt. After waiting several days, there was no response. A follow-up later to the Prime Minister also failed to get a response. Irated with being ignored he was further enraged by a letter from his father. He decided to enlist a solider, leaving his family behind and to quit Europe. When he and his brother, who faithfully joined him, the settled out to offer themseleves as voluteers at India House. Apon arrival they were told no more ships would be sent out that year but if they returned in the next month of March they could enroll. He return to Ireland in 1788 at the wishes of his wife’s grandfather. A year later he resumed his bachelor of laws to which he had little interest in. After being called to the bar he attended his first Leinster Circuit. His dislikes for the profession grew and he considered himself the most ignorant barrister in the Four Courts. There was an undercurrent of sectarian unrest in Ireland during the 18th Century. So the French Revolution of 1789 rekindled the dream that Ireland one day would be free again. The Ulster Presbyterians admired the French doctrines as they resented the restrictions placed on them by the Anglicans in Dublin. In Belfast, a group of Dissenters formed the Society of United Irishmen in 1791. Their original objective was to be that there would be less religious discrimination. This was granted in the 1793 treaty the Catholic Relief Act but by then spurred on by what was happening in France their objective had changed. They now sought freedom from England and for Ireland to become a republic. The loudest supporter of this cause was the young protestant lawyer, Theobald Wolfe Tone. In 1794 he was nearly caught by a French spy but managed to escape to America. On arriving back in France he persuaded the French government that Ireland was ready to revolt. They sailed for Ireland in 1796 but strong winds made it impossible to land so the ships returned to France. The British government and the Dublin administration breathed a sigh of relief. The government tried to repress the population by any means necessary and an army commander named General Gerard Lake carried this order out to the letter. In 1798 he captured and imprisoned the Lenister Leadership of the United Irishmen. The Irish rebellion of 1798 was without those that had sought to give the rebellion purpose. In their absence the rebellion took a turn for the worse as Ireland was about to find out with the Act of Union in the 1800’s. Wolfe Tone was sentenced to be hanged on November 12th 1798 but instead he slit his own throat and died on November 19 1798.